Counting calories has never been this easy! With the free Calorie counter app from YAZIO you can effortlessly keep track of your daily calorie intake. Whether you’re looking to lose weight, gain weight or simply maintain your weight, our calorie counter is what you’ve been looking for. Download our app from the google Play Store or iTunes Store, and be on your way to reaching your health goal today! Track your nutrition habits. Quick and easy with YAZIO. With the YAZIO Calorie Counter, watching what you eat is so simple it only takes a few minutes per day! Set your personal goals to lose, gain, or maintain weight. Then, track your results. Visualize your progress with a chart and summary of your daily nutrition. Scan brand-name products with our built-in barcode scanner to quickly look up thousands of foods. Log your weight progress and daily fitness activity, choosing from 200+ sports. Getting in shape in a safe, sustainable, and scientifically proven way - more efficient then any diet. YAZIO really works. What our users say. YAZIO is super simple to use and extremely easy to handle. Plus, YAZIO has a huge database of foods. And if the food isn’t there yet, you can simply add it. With that, YAZIO makes counting my calories a breeze. Finally, no more annoying calculating. YAZIO does everything for me! With YAZIO I’ve finally got to know my eating habits. I was amazed at how many calories, carbohydrates and fats I was consuming every day. With YAZIO, I have a much better view of the calories and nutrients, and can be more conscious of what I’m eating. With the daily entry of sports and body weight, I can also document my progress really well! Looking for a quick and easy way to keep track of your health? With the free YAZIO Calorie Counter App, tracking your eating habits is a breeze! You can easily track your daily diet, evaluate your progress and make long-term health goals a reality. 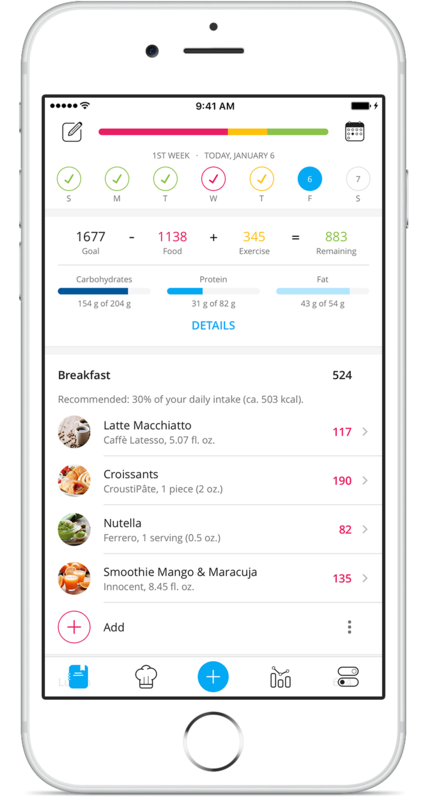 Our calorie tracker allows you to view your diet from a completely new perspective, helping you to better understand your daily eating habits. This not only helps you reach your weight goal, whether it’s to lose weight, gain weight or simply maintain your weight, but it puts you on the path to long-term success as well. The YAZIO Calorie Counter works as a nutrition tracker, breaking down your daily consumption of calories, fats, protein and carbohydrates - showing you from which foods and drinks you are consuming your daily nutrients and calories come from. Depending on your personal objective, a realistic daily calorie goal is calculated for you. So, what makes YAZIO different from any other calorie counter? The answer lies in its simplicity. We know how difficult and demanding it can be to keep track of what you eat how many calories you’re consuming with each meal. Besides, who wants to spend hours searching for the amount of calories in a simple snack? That’s why our calorie counter works to give you the best experience possible, making it a breeze to quickly add meals throughout the day. The YAZIO app is easy to understand and even easier to use, so you can focus on your main weight goals, rather than getting caught up in unnecessary and time-consuming details. Simply download the YAZIO calorie counter online in the iTunes or Google Play store, and we’ll help integrate your food diary quickly and easily into your everyday life. For a personalized and effective YAZIO experience, you’ll need to go through a short registration once you purchase our free app. This registration is a necessary step to reliably store your data and make it easily accessible to you in the future. During this short process, you’ll need to specify your gender, age, height, current weight and daily activity. All of this information will help us to establish a highly personalized and appropriate approach to your calorie and weight loss goals. Plus, with your YAZIO app account, you can access your data using the calorie counter on multiple devices. As a German-based company, we are subject to the extremely strict German Data Protection Act, and all data is stored exclusively on German servers. We do not share your data with any third parties, the information transmitted is always encrypted, and your data is stored anonymously on our server. Any access requests for your device (e.g. camera access for the use of our barcode scanners, or memory contents for picture uploads) are used solely for the functions we offer within our calorie counter. We will never ask permission to access your identity, location or contact list. Our calorie counter has tons of great features, making it fun and easy to track your progress! With our enormous food database, you can choose from tens of thousands of foods and products you’d find at the grocery store. Plus, you can choose the specific serving size to better calculate your consumption. Adding any food item to your calorie counter diary is just a click away. We recommend marking your frequent food items as favorites or adding them to a complete meal. That way, it’s even faster and easier to log your calories. With the help of our calorie counter calculator, you can see exactly how many calories you’re eating daily and where they’re coming from. The app even goes one step further, calculating the calories burned from any sports or daily activities you log. With a nutrition counter that calculates where you’re calories are coming from, how many you’ve consumed, and how many you’ve burned, reaching your weight goal will be a piece of cake! Wanting a calorie counter specifically for weight loss? Then you’re definitely in the right place. If you regularly record your body weight, we’ll provide numerous charts and reports that can help you keep track of your progress. But it doesn’t stop there. In addition to your weight, you can also store values such as body fat, waist and hip measurements, blood pressure and blood sugar. With an calorie counter so easy to use, you’ll be amazed at how fast you’re on track to a happier, healthier you. Ready to take it one step further? Then YAZIO PRO is for you! PRO is a useful addition to our free app, and is available via in-app purchase. It’s fast, easy and there’s no hidden catch. YAZIO PRO isn’t a subscription, so you don’t need to worry about any pesky auto renewals. Simply choose from 1, 3 or 12 months, and you’ll pay a small, one-time fee. So, what’s in it for you? With PRO you have endless possibilities. You can easily retrieve any of your data and use it for useful evaluation and interpretation. In addition, you can bring your calorie counter diary into the future, using it to better plan your daily routine. Still not convinced? How about a memory function that helps remind you to log your meals and activities when you forget! Our experience shows that YAZIO PRO users reach their weight goal in half the time. So, what are you waiting for? Start using YAZIO’s calorie counter today and breathe new life into your daily routine. We’re certain that with a little help from us, you’ll finally kick the bad habits and be on your way to a sustainable, healthy lifestyle. What have you got to lose? Besides the weight, that is!